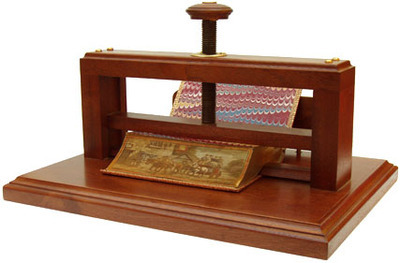 This item is called a fore-edge clamp, and it's designed to display the secret fore-edge paintings on your books. Needless to say, it's incredibly expensive, but if you can afford a collection of books with secret fore-edge paintings, you can spring for this. A secret fore-edge painting is one that is revealed only when the pages are pulled back as shown. When the book is fully closed, only the gilt edges appear. Here is a magnificent 1898 fore-edge painting of a whaling scene from the Colorado State University Libraries Rare Book collection. Some books have double fore-edge paintings, so that one picture is displayed when the pages are spanned in one direction and another when they are spanned the other way. There are also triple fore-edge paintings. In this case, the edges seen when the book is closed are not gilt, but have a painting on them as well. Thanks Mrs. Hap. I'm always fascinated to discover things like this that I had no idea existed. I just can't get too interested in these kinds of paintings because then I'd have to collect them too. I was worried for a moment though. You know how I misread things sometimes. I thought for a moment you were waxing on about a fore-skin clamp, which, given some of the medical devices you've explained, wouldn't be totally out of the question. Then, given my prediliction for artful paradidomania, I thought perhaps that this device might not be mutually exclusive in that context. Perhaps it's an explanation for how paintings like this came to be. See, initially, it is used as a foreskin clamp - on the artist - and this creates a kind of enforced frottage technique to insure that the painstaking work of painting the slanted gilt-edge is of high quality. Upon completion, the imprisoned member can be exchanged for the book in a kind of reverse decalcomania. Damn. I've been hanging around PW too much again.